As students head back to school, the competition heats up on the playing field. Everyone loves a good competition and joining forces to beat a cross-town rival helps drive the desire to be part of the team. But this competition is not on the football field, it’s in the school! Ready to play in the Recycle-Bowl? Organized by Keep America Beautiful, Recycle-Bowl is a friendly competition and benchmarking tool for K-12 school recycling programs. Competition helps to create excitement and enthusiasm for recycling. Recycle-Bowl participants track and report how much material (cans, cartons, bottles and paper) they collect during the four-week fall competition. And, results are measured on a per capita basis, so a small school has just as much opportunity to win as a large school. Recycle-Bowl can help establish new recycling programs within schools, increase recycling rates in schools that currently recycle, provide “teachable moments” about recycling and waste reduction, and divert material from disposal. The competition is open to all public and private elementary, middle and high schools. Statewide winners and a National Champion will be chosen based on which school collects the most recyclable material per capita. Schools that host a community recycling drop-off program will compete in a separate category. Collection takes place from mid-October through mid-November and coordinates well with America Recycles Day on November 15. School data is due in mid-December and winners are announced in February. Whether a school has extensive recycling in place or is just launching basic collections, Recycle-Bowl is an excellent way for teachers, student green teams, and facility managers to engage their school community in recycling in a fun and friendly way. 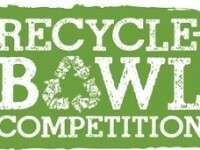 For more information, or to enroll in the competition, visit Recycle-Bowl.